I met Cara Leopold online a couple of years ago, when we were doing a blogging course together. I soon learned that we have many things in common. We are both independent online English teachers, film lovers, and live as expats far away from our home countries. 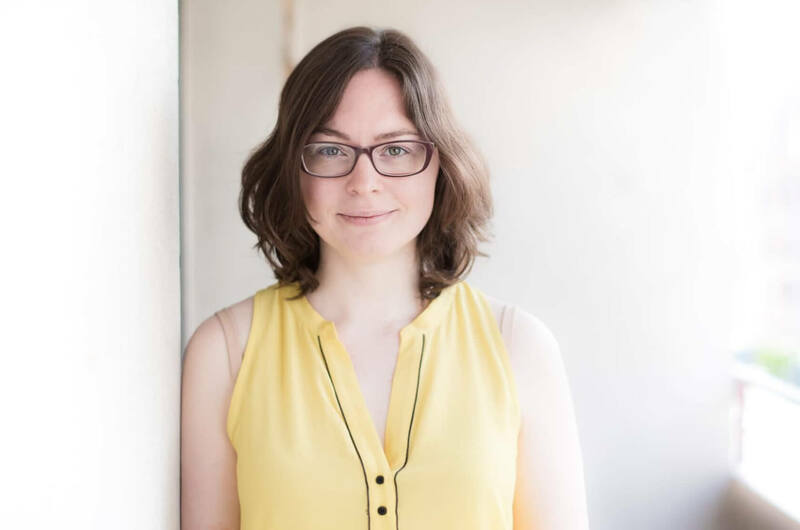 Cara is a listening teacher and helps English learners break free from subtitles, so they can enjoy their favorite TV series and films more and better understand native speakers in real life. 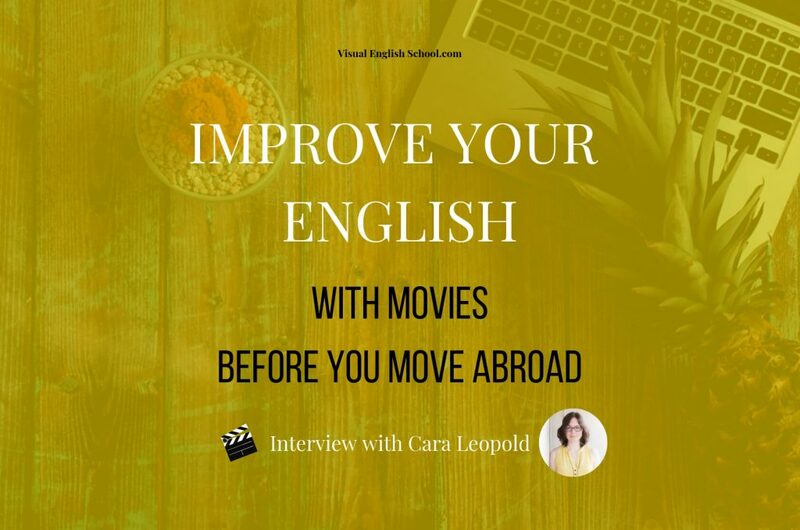 If you’re dreaming of moving abroad and want to improve your English with movies, Cara can give you some invaluable tips. Cara, you’re a listening coach, right? Let me just say that your job seems so exciting! But what do you do exactly? How do you help English learners? Yes, I suppose that is my job. I think I usually call myself a “listening teacher” but other people have called me a “listening coach” before. I help learners master the most difficult, yet the most important skill for becoming proficient in English – listening. I teach effective skills to understand fast spoken English and I also give people feedback and explain why they can’t understand what they’re hearing. This is the crucial aspect and the reason you should work with a teacher to improve your listening – you need someone who can explain the difficulties you’re facing and guide you to a place of understanding, while being supportive and empathetic of course, which is what I hope I manage to do! Why is it so important to break free from subtitles? I mean, of course, it’s an entirely different experience to watch a movie and enjoy the actors’ performances instead of just reading the subtitles. But apart from that, what are the benefits of becoming subtitle-free in our daily lives, in general? Well, I guess the first thing to point out is that real people don’t come with subtitles. So when you work on your listening skills to the point that you don’t need subtitles, you not only enjoy what you watch more, you also have real-life conversations more easily because you understand what people are saying to you. It enables you to break free on so many levels! Many students ask me whether they can just watch films in the evenings and absorb the language step by step. Is it possible? Do you think passive listening works? Or should watching movies always be a guided activity? I think you need to strike a balance between just passively listening and being more active. If passive listening worked for everyone – and it must work for some people – then no-one would be complaining about their listening skills. But it’s one of the most frequent complaints I hear about English learning. And I see more and more teachers trying to help learners with it. So I feel that it’s pretty safe to conclude that passive listening is not enough for most people. That said, it doesn’t require much extra effort to make your listening more active. You could argue that turning on the subtitles is an active listening activity – because it raises your awareness of the difference between spoken and written English. You can then make that into an even more active activity by only switching on the subtitles for some scenes, and switching them off for others. And you can get even more active by stopping to do a dictation now and again – listen to a few seconds of audio, write what you hear, then check your transcription with the subtitles. Make sure as well wherever possible that you’re using listening resources with some kind of text. That could be a podcast with a transcript. It could be a film or TV show with subtitles. You’re from beautiful Scotland, but you live in France. How did you end up there? I came here after I finished my degree in Linguistics with French at Nottingham Trent University. There was a bilateral exchange programme which enabled me to come to the University of Franche-Comté here in Besançon to work as an English teacher. The contract was for 2 years maximum but I enjoyed my time so much that I decided to stay. It’s been almost 12 years now! What linguistic or cultural challenges did you have to face when moving abroad? It’s almost getting hard to remember but I quickly realised I didn’t know as much French as I thought I did, despite being top of the class through most of school. And I wasn’t really ready for everyday, street French. The expectations are often a lot lower for British people learning a foreign language than they are for non-native English speakers learning English. The university system is quite different to the UK one. I naively assumed they’d be the same! Students have a lot of classes in the French system. The marking system is quite strict and they don’t really have pastoral care the same way we do in the UK. So that was a big shock that took me a good semester to adapt to. How did you prepare yourself before embarking on the big move? Did you immerse yourself in the French language? And how? Good question. I was studying French anyway and trying to recreate an immersion environment too. I had already spent 2 summers in France before I left so I was totally sold on the immersion idea and was just trying to do it as best I could before I went away. This was in 2007 so there were no smartphones and not so many language websites, if any! I used to listen to the French radio with an actual radio – from the UK you can pick up certain French radio stations on the long wave frequency. I also used to rent movies on tape from the library and read the magazine, Le Nouvel Observateur, which I had a subscription to. I would occasionally bug any French Erasmus students I bumped into. Oh and I attended a couple of Alliance Française meetings in my city to practise speaking. It was intimidating though because some of the people there had already lived in France and could speak really well! I was probably the youngest participant. There is no one magical solution for mastering any area of English. There isn’t one. So just stop looking! Many people idealize life abroad, or as happened to me, idealize life back home as it used to be. But what’s an expat life really like after the initial sparkle fades away? What was your experience? Well, now it’s just my day to day life, my routine so I don’t really notice it much anymore. There aren’t so many things that surprise me. I think when you first move abroad, some of the differences can really shock and annoy you. So in my case, there were a lot of work-related things that were a pain. Also small, day-to-day things like the fact that shops aren’t open on a Sunday, or that they often close for a couple of hours in the middle of the day. And having to say “bonjour” every time you go into a shop – I tried to avoid that for a long time! But it’s really important to say “bonjour” in French, in shops especially, and also with colleagues. Even people at work you don’t really know but bump into in the corridor – it can become quite comical after a while! Many students complain that when they go to an English-speaking country they feel incredibly frustrated, because they have no clue what people are talking about. I mean even students who have been learning English for years or passed their language exams brilliantly have difficulty. Why do we understand a documentary about environmental issues perfectly, but then struggle to understand native speakers in a pub while drinking some ale? Haha – that’s such a funny example. Maybe the answer, in part, is that we spent too much time listening to environmental documentaries when we should have been listening to real people speak. So part of the problem is that people use the wrong materials. If you change materials and start listening to real conversational speech early, it will make things easier. I actually wrote an entire article on a colleague’s website about why it’s so difficult to understand your colleagues at the pub, even though you understand them during the workday. It was based on a question a student asked me. I actually think you should avoid the pub environment if possible, especially for group conversations. It’s just so noisy and the alcohol doesn’t help matters. But yeah, essentially, people speak differently because they’re speaking more informally – so the words they use change. And they’re putting more attention on building relationships rather than speaking clearly, so the way the words sound changes too. In a documentary, it’s not even a conversation that you’re listening to, just a monologue. The goal is to convey information clearly, not to connect and build relationships. Both are “spoken English,” but they couldn’t be more different! That’s a great point actually, we talk a lot about how spoken and written English are different. But there are also different kinds of spoken English and different kinds of written English. An academic essay is not the same as a text message to your friend. And a Shakespeare play performed aloud is not the same as a casual conversation! …we don’t always pronounce words in a nice, clear way. In fact, often, it’s actually more difficult to pronounce each word clearly, distinctly and individually. Let’s imagine that I’m an English learner and I want to move to the UK to study or work. How could I get ready and “prepare” my English so that I feel less frustrated once I’ve arrived there? Do you have any listening tips? Well, as I said before, make sure you’re listening to the right kinds of English. By right kind, I don’t just mean conversational, but also the type of English that motivates you. So if you like movies and TV shows, watch those. If possible though, watch shows or movies with contemporary language that’s close to natural conversation. If you’re watching historical dramas or classic Hollywood movies, it’s not the best type of English for preparation for real life. Why not try out some reality TV shows, comedies, or contemporary dramas instead? Avoid or reduce listening to academic monologues like TED talks or the news. Instead, why not find a podcast where a journalist interviews people about current events? That way you’re at least listening to dialogue. Instead of watching TED talks, you could listen to the TED podcasts. The TED Interview would be a good option here. Wherever possible, listen to the target accent of the place you’re moving to. If you need extra help with that, use a resource like the IDEA accent archive to listen to speakers from specific regions. You’ll hear the words, expressions, grammatical structures in speech that you know, you’ve learned, but you can’t match them to a meaning because you don’t recognise them. That’s because you don’t know how they really sound. 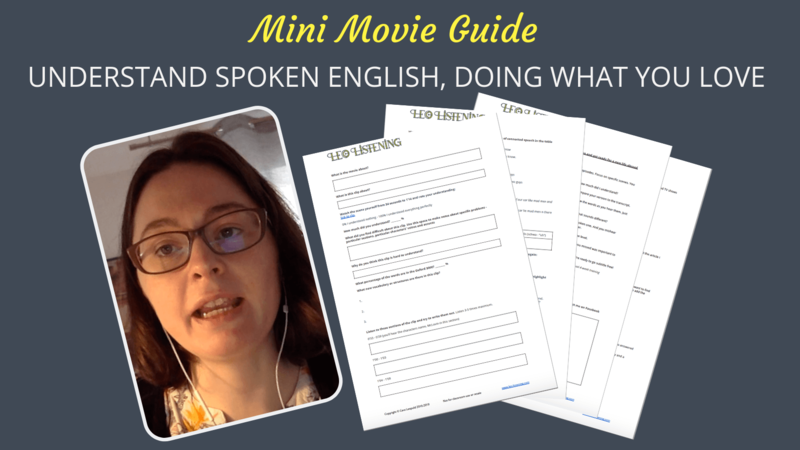 You’ve just prepared a mini movie guide that helps English learners use their favorite movies or TV shows to understand fast spoken English. What is this guide exactly? How does it work? You download it for free. I give you some listening exercises to do and guide you through the difficult parts of the clip. This is the game-changer – instead of just doing dictations or whatever on your own, I break down and explain the difficult parts of the clip to help you catch them. As a real film lover, I must ask you whether you have a favorite feature or short film that you recommend. And what does that film mean to you? Oh, it’s so hard to choose a favourite film, there are so many! I think it depends on my mood. Actually, I picked up a brochure yesterday for one of the local theatres that also organises cinema screenings. They’re going to be showing the original Alien movie directed by Ridley Scott. I love that movie. Thank you for sharing so many juicy tips with us, and thank you for the awesome interview, Cara. You can download the free mini movie guide here. 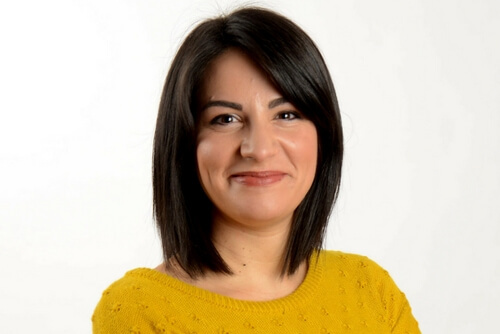 Read her guest post: Why do I understand my colleagues at work but not at the pub? And what to do about it. What about you? 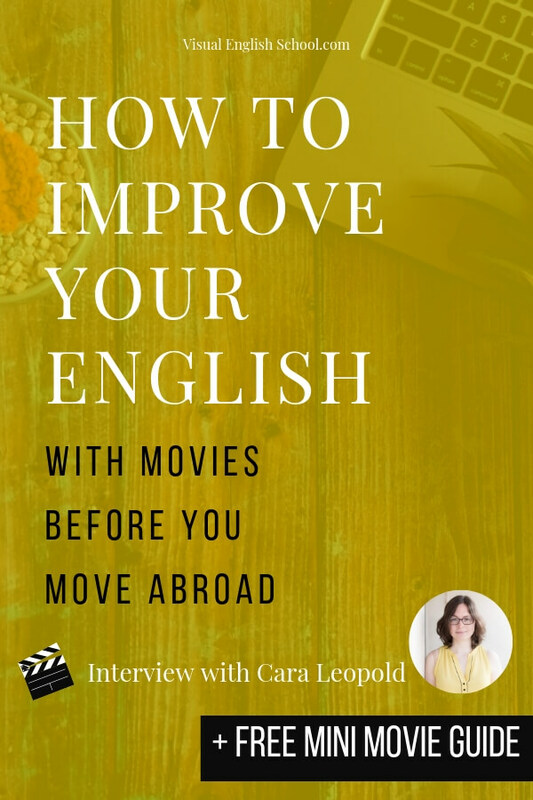 Would you like to move abroad for a short or long period to improve your English? How are you getting ready for the big move? If you want to comment on the interview or ask your questions, just click here. If you’ve enjoyed this interview, can you please share it on your favorite social media?